Ok ok I admit it a little more than basic but its surely no polymer clay tools 101. The good thing on polymer clay tools is... you can invent them . Seriously take for example a loop tool a tool needed for carving details into clay. Take a paper clip or a hair pin add a handle from fimo scraps cure it and you have made your own. Yep, you can not only get creative with Polymer clay, but as well by making tools, turning things into tools and inventing your own tools just as you need them. There are basic tools one must have, like the polymer clay blades, an exacto knife, a rolling pin and a (non sticky) working surface. Those are the basic tools everyone must have and should buy to get started. I tried to list some to buy tools, some you may find around your house. Just the ones I have (or want to have), but, by no means all of them. There are so so many tools, and they seem to get more by the day, so it seems to be nearly impossible to list them all. I for example left out tinfoil and wire, which you would obviously need for creating greater figurines, but as I have no experience what gauges of wire etc, I left that out on purpose. Interesting. It's much like a painter would use other then just a brush. I like David's idea of a dental pic. There are so many objects/tools we can use as artists. It's just a matter of thinking outside the box. Great article, my friend! many people who start working with polymer clay usually do so by taking the brand they have available in a store around the corner. I offered to help out with project educate and set up a beading tool compilation for all the beading beginners out there, and it might turn out an interesting read for the intermediate too. I want to explain the tools, the must haves and the should haves. There where so many different tools, pliers, and cutters, snips and what else. So I decided to make the 101 the one place you could look for, when you need to look up stuff. And to make sure you don't get bored with me babbling away we get right to the point Beading tools cover all those things you need to start with beading and as well those to make beading life a lot easier and comfy. We all do love when it gets comfy don't we? I highly recommend to get good pliers instead of cheap ones. Those will make you regret it because sooner or later you will get good quality ones. I offered to help out with project educate and set up a big beading 101 for all the beading beginners out there, it might turn out to be an interesting article for intermediates too. Little did I know then, what a HUGE task I had ahead of me .. I probably would have run and hide if I would have. Or yelled: "Bead me up, Scotty"
so you are still with me Wonder if you are at the end of this. Its getting lengthy, don't say I didn't warn you! May the beads be with you! Seed Beads nowadays is a generic term for many small beads. There are various types in shape and size such as Round, Cylinder, Cube, Hexagon, Bugle, etc. Plenty variety of seed beads are used in a wide array of ways to create stunning works. They may be used for simple stringing, or as spacers between other beads in jewelry. Larger seed beads are used in various fiber crafts for embellishment, or crochet with fibre or soft, flexible wire. 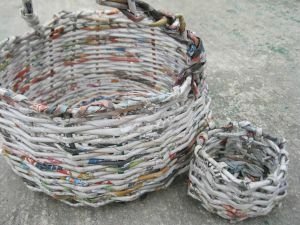 PE: Wire-WrappingThis article is a short introduction to wire-wrapping, including information about wire-wrapping terms and tools, methods, tutorials and a feature of beautiful jewellery. "wire-wrapping" is - like the name implies - a technique where wire is wrapped in whatever way. It can be used to hold gemstones in place, and create intricate jewellery. It has the big plus that soldering isn't neccessary, and therefore all the equipment needed is relatively easy to come by. Wire comes in different different sizes and forms, and you can choose between materials as well - you can use brass, copper, silver and gold wire. Wire diameter is measured in 'gauge' and ranges from 14 gauge (~1/16 inch) to 26+ gauge (1/64 inch), so the higher the gauge number, the thinner the wire. Fine metalworking is most often considered a medium for jewelry making, although it can be used for other works as well. Many artists have made wall pieces, sculptures, reliquaries, vessels, and other less traditional works with metals. Fine metal is a very versatile and exciting medium that challenges the artist to create beautiful works of art from something that, at first glance, might seem very hard, rigid and unforgiving. Fortunately crafters have been working with metals throughout history, and contemporary artists can still rely on the techniques of those pioneers to see metals in a new light - as soft, malleable and functional. Bishoujo "beautiful young girl" is the term often applied to the attractive female characters in anime and manga. The counterpart is Bishounen "beautiful young man". Some equivalents in different ages are Bijinga, "beautiful person", and Biseinen, "beautiful man". On a collective whole they are called 'bishies'. Why draw attractive people? Really the question is why not? It is your art and you can draw what and however you feel like. This is a series of tutorials to help you on your way to understanding the style. However, like any other style, this one is up to your interpretation. Since attractiveness is a concept that is different between the individual, the art of 'attractive beautiful people' is also going to be diverse. Conversely, reversing the ideas and potential techniques, can make your character less attractive? Introducing Poetry Basics Week!Hello everyone and welcome to Poetry Basics week at projecteducate! This is our third literature based week in partnership with CRLiterature and we've chosen this subject due to popular demand. Whether or not there is a difference between these two major art genres is something that is highly disputed in much of the art world. I should start off by stating this: there are many opinions on the subject, but there is no definitive answer. That being said, this article aims to be more of a thought-provoking discussion of the subject than an informative article! I've shared this nifty little trick before - a home made tripod. It sounds impossible, but actually it's really practical and much easier than lugging the real thing around with you if it's not needed! Check out this articlefor more information on how to create it! Wire Working 101My start to wire art is one that is, well, rather twisted. I had declared myself a History major in my Junior year at University. To counterbalance a heavy load of research-based classes, and to stimulate my own creativity, I signed up for Beginning Sculpture. The irony is that this single class was something that ignited an interest that I never knew that I had. By the end of the course, we had done clay sculpting, latex work, marble carving, wood and fabric art. Welding proved to be too nerve wracking for me due to volatile gases and high temperatures, but the professor handed me ¼” corrupted aluminum wire welding rods and asked if I could bend them. I could. He told me that the basic human shape was the triangle of the torso and left me to work. I was immediately hooked. JAN.-FEB., and MAR.-APR., and MAY-JUNE, 2014 !! and so this particular Monthly Activity is open to ALL Members. Simply Watch for the Group Blog announcing WHEN and HOW to vote. The NEXT one will be out on AUG. 31st. Jewels of June and July! 3. NEW- Special Groups & Other Special Info. 6. NEW- 112th Special Random Feature!! 7. NEW- Special Edition Feature: "Supporting Other Jewelry Makers!" Hello and Thank You to Anyone who has a chance to read my journal. I know time is VERY precious. Though we are over halfway through June, I can only hope it's been a good one for you all! a truly JOYFUL rest of June AND, ALL of JULY! March's TOP Subs of Unframed-Nature and NEWS!Welcome to MARCH 2013’s Top Submissions of Unframed-Nature. Thank you for being here whether you are a Member yet or not! We welcome you and your support! We continue to grow each month, with more talented artists of a variety of art media! A GRAND Welcome to ALL of Our NEW MEMBERS! And a HUGE thank you to our loyal Members who have been submitting your fabulous Nature Work to our Group for a long time now. Without you, we simply wouldn’t be here. We usually have an ALL-MEMBERSHIP voting, as we believe this is the Group's Group, but once in a while, we have a few months during the year, where only the Admins. vote. we appreciate their time and efforts! 2. NEW- The FIVE for FIVE Feature! 7. NEW- 110th Special Random Feature!! 8. NEW- Special Edition Feature: "Earth Day, Every Day"
The image is so stunning, and what a truly thoughtful sentiment! 4. NEW- Extra [EXTRA!] Special Thank You's! 6. NEW- 107th Special Random Feature!! 7. NEW- Special Edition Feature: "La Tour Eiffel"
I'm think I'm running behind, more than is usual, and it's far into January, by now. But I think you can still send out wishes for the new year, through the end of January! I do wish for you ALL, a wonderful 2013, full of many good things! that you will have a Fabulous February, as well! I won't be here to make a Profile Journal in February. Moustache Madness Competition! VOTE NOW!VOTE NOW! The 5 finalists have been chosen! Thank you to everyone who entered the competition, we are really happy that many of you participated. Here are the pieces that have made it to the final round. Moustaches of all shapes and sizes are welcome in this competition, they can be impractical, evil amazing or just plain crazy! But remember with a great moustache comes great responsibility! This can be in the form of moustaches riding solo, on a character, ON THE WORLD!! RULING THE WORLD!!!! ON A LAMMINGTON!!!! !